We’ve been lucky enough to help support 311 Oxford Street, Uniqlo’s UK Flagship location, with many projects in the last month which has certainly kept us busy here in the Bright Leaf studio. From window installations to bespoke props in-store we thought we’d share an update on all things Uniqlo. 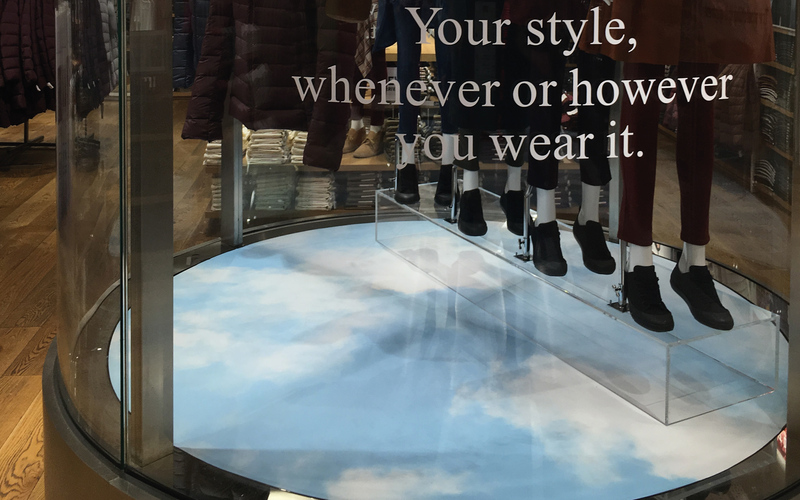 As an exciting pre-launch to this new collection, we helped to curate, source, produce and install a room set window display showcasing the simple style of the Ines de la Fressange AW17 range. One of the worlds best dressed females, La Fressange is a French model, aristocrat, style icon, fashion designer and perfumer – so we were careful to ensure the props and design of the window were just so. Concentrating on clean lines, neutral colours and leaning towards nordic design, we curated a simplistic backdrop to complete the stunning range. 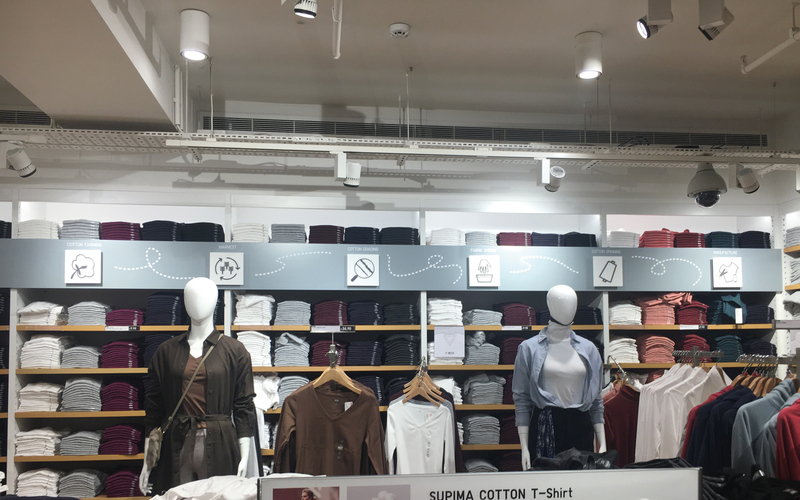 The use of large natural birch logs, gorgeous rose gold knitting needles, plush floor coverings and wooden furniture created the look and feel Uniqlo desired. A low, white washed wooden wall with ornate panelling sat beneath two supersize decorative hanging graphics (printed by our sister company The Graphical Tree) each framed in Oak which finished the window display off perfectly. 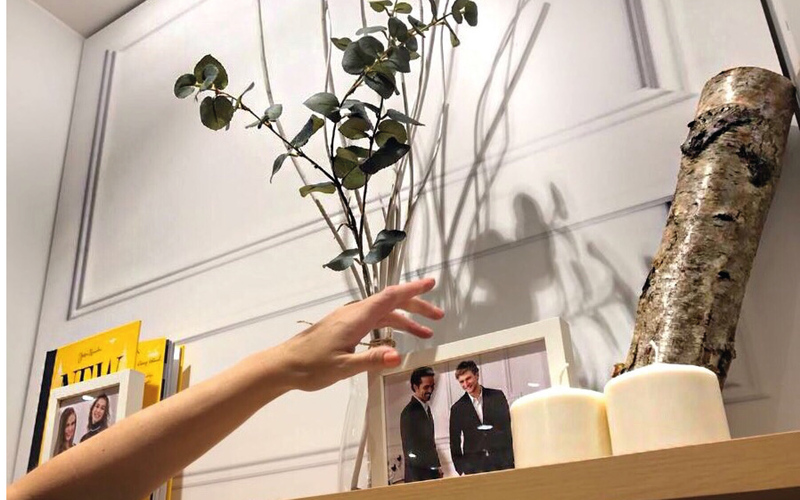 A week later we moved the same stylish room setting concept in store and filled a brand new Ines Department with ‘mini snapshots’ of Ines life. This included candles wrapped with twine, wooden frames in many finishes, hand wound balls of wool, books and foliage. Furniture in keeping with the window was used as part of a model display in the centre of the department which provided a strong destination area for the new collection. 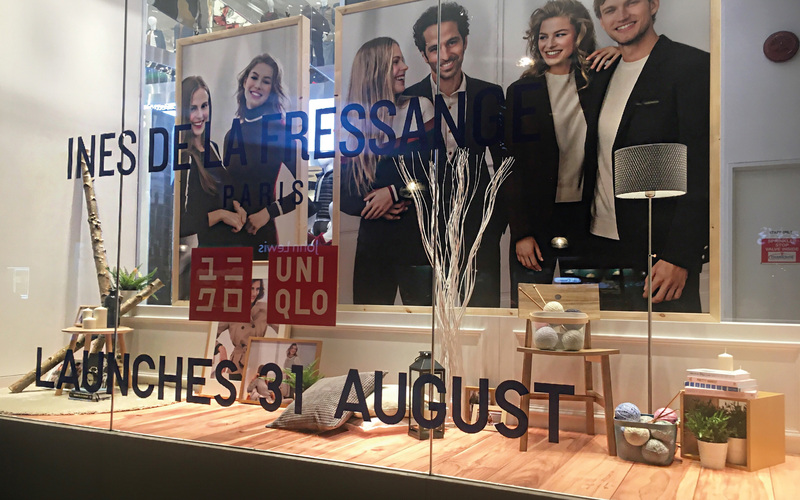 Teamed with Uniqlo’s own graphics and perfect (as always) store standards the Ines de la Fressange collection was, and still is, a huge success. Everyone knows that Uniqlo are famous for their Ultra Light Down jackets and vests and as Autumn creeps in from around the corner it was time to launch new colours and styles in both menswear and womenswear. Yay! Our task was to create tank installations which looked as though balloons were floating away carrying the ultra light garments attached on invisible busts. After a little research we opted for 400mm diameter acrylic spheres with a 30% white opacity which looked and gave the impression of balloons. (The garments really are that light so balloons would have worked too, but the acrylic spheres have more longevity plus would work well if store VM teams wanted to reuse them at some point). Both mens and womens tanks were dressed with a dreamy sky graphic floor vinyl and huge cut letter vinyl on the outside. 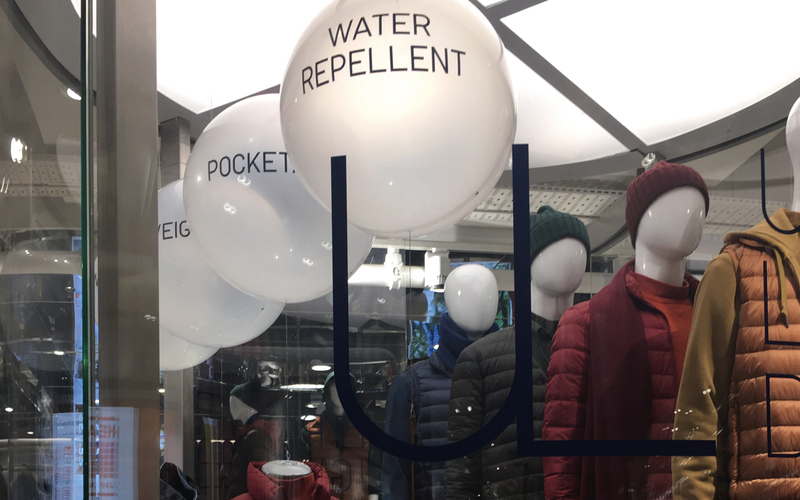 The spheres were intricately suspended from the existing acrylic ceiling, vinyl lettering was added with key words reflecting the benefits of the product and the jackets on invisible busts were seen to be floating in mid air. A uniform line of four mannequins were secured on a 10mm clear acrylic base unit which again gives the effect of the mannequins themselves floating up into the sky. 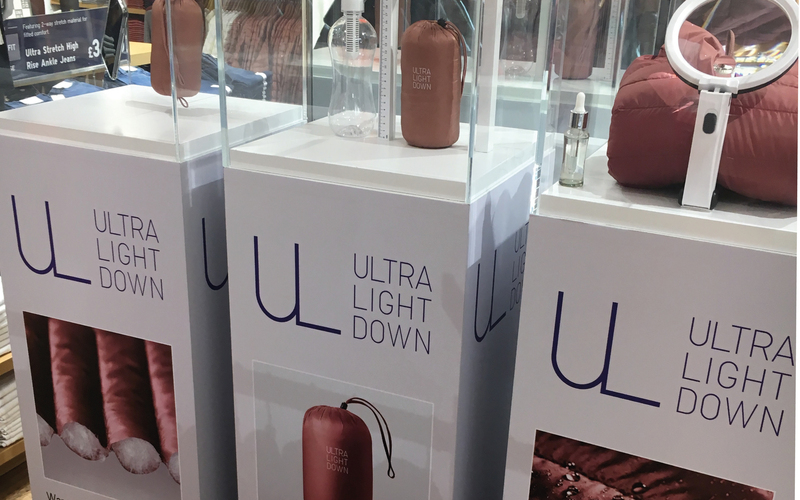 If you look a little further in each department you will find our updated ULD totems helping to explain the features and benefits of the Ultra Light Down garments. These plinths, with encased showcase tops, display bespoke props to help visualise key features such as the garments are water resistant. Therefore by using clear resin we created tiny water droplets which were then placed under a microscope. Other props we have sourced here include weights and faux mobile phones, each helping to explain the products pull factors. We produced these last year for the Uniqlo and have given them a little makeover refresh. 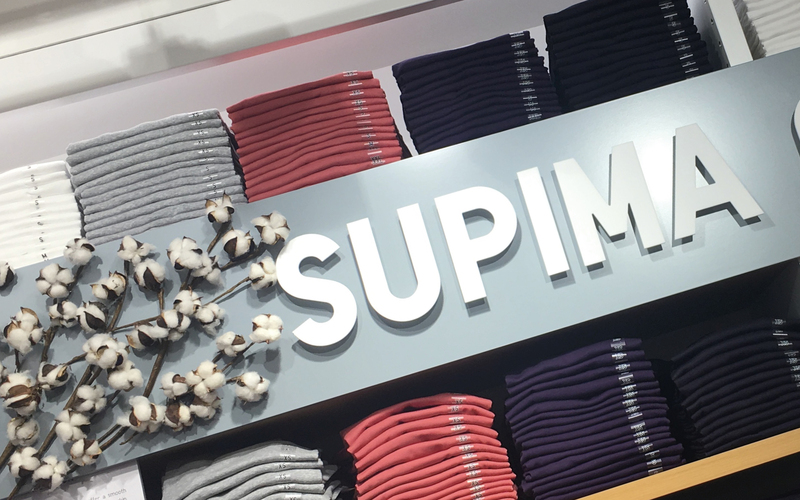 There are many stages that have to take place for a Supima Cotton garment to go from farm to the finished article you see folded on the shop floor. Each stage required it’s very own descriptive graphic icon which we designed in house and then cut from 5mm matt acrylic. This was mounted to a 200mm squared white matt acrylic to create a semi-museum/art gallery feel to the timeline which was then mounted to the wall to run along the length of the department. 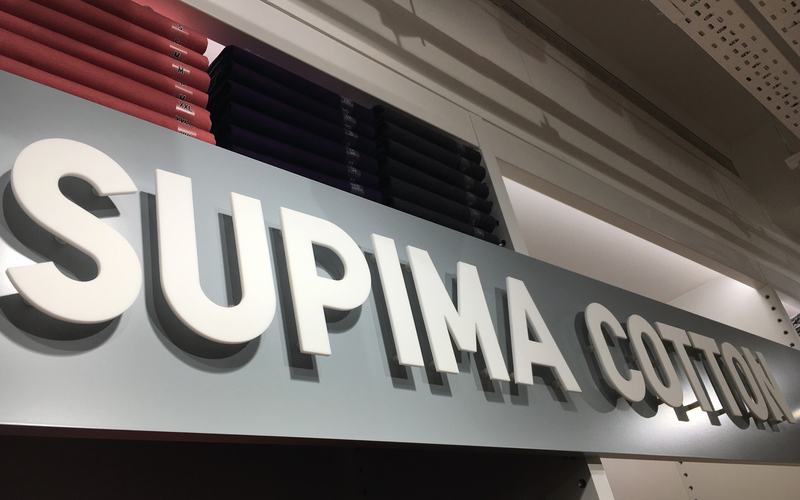 In addition to this we created a large acrylic department title so that customers could really see that they had reached the Supima Cotton area. The finishing touch was faux cotton stems in their most natural form (not real ones of course – as they would be too messy, plus they are out of season) fixed up and around the large letters. We feel this 3D element sets the department out from others. Very clean, natural and simple. Never before have we been asked to stretch garments as far as we could but this project asked for just that, so a rather fun one! 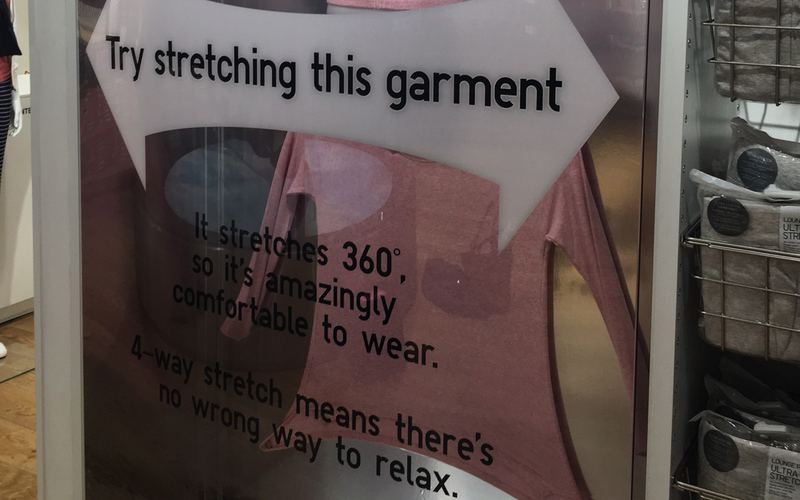 The new Uniqlo stretch cotton sets are designed to be the most comfortable, stretchiest loungewear you can wear and to show how the fabric can be stretched 360 degrees without altering the shape or structure of the garment involved a brainstorming session to come up with various ways to visualise this in a wall bay. From hula hoops to extendable arms we landed on stretching the garment to it’s maximum potential flat on the back wall whilst then showing the same garment on a half busts/legs. Using elite brushed metal fixings to hold the garment in place, we drilled into our stylish silver printed mirrored backdrop, added 3mm black foamed CNC cut lettering and then finished the wall bays off with further signage on our curved freestanding acrylic surround. We love it, and it certainly makes you want to grab a top and see how much you can stretch it. 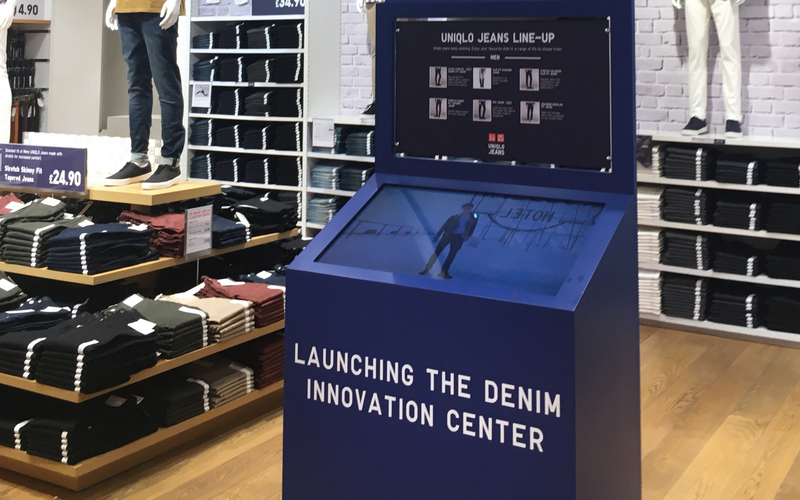 Digital screens are always a great way to interact with customers and for the launch of new denim styles Uniqlo asked us to design and produce units to house screens which could play A rolling feed explaining the design, inspiration and creation of their denim wear. We opted for 40 inch screens encased in wooden fabricated units, spray finished to match their department colour scheme. The upper section of the unit has clear removable acrylic panels to house graphics – in this case explaining the denim styles available to both men and women respectively. White and beige hues were on the menu for this exciting project. We were asked to create a room set style in the updated Inner-wear department. The department focuses on women’s loungewear and lingerie and we knew exactly how we would promote the delicate ladies garments. We manufactured a small rostrum which we then topped with a white wash floorboard graphic design. On top we added a fluffy floor covering, a chaise lounge and metal trunks with luxurious rose gold detail. Above the display we added an eye catching lighting feature – a sporadic array of lampshades in a cascading cluster. The overall effect was feminine and simplistic yet stylish allowing you to focus on the delicate Innerwear. Around the outside of the department we clad the wall bays and the sides of the large floor fixtures with carefully routed, ornate sprayed MDF frames, each with an oval cornice. These gave the effect of a bedroom or boudoir dressing room. They soften the area and provide a more boutique finish to the wall displays. To complete the look we added cut lettering to the oval cornicing at the front of the department as well as an additional eight MDF frames featuring printed graphics explaining the styles and products available in the neighbouring fixtures. 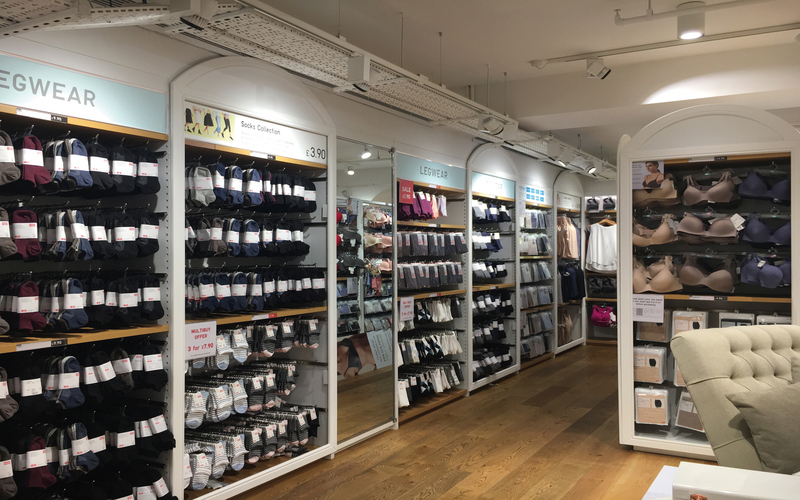 Uniqlo have a long standing partnership with Disney and produce a variety of t-shirts, sweatshirts and accessories so we were proud to help create a new destination for this on their ground floor. We created a large Mickey Mouse silhouette which covers three wall bays. Red vinyl wrapped shelves and backboards are layered over with a huge Mickey Mouse cut out shape. This is fixed to the wall in CNC panels of MDF with black foamex frontage to finish the look. To create more fun and interest the silhouette rolls onto the floor so a section is created using floor vinyl in black with a floor seal. A central iconic logo was then aded to the top section. Simple, but really effective. We love last minute projects and this was certainly one of those. 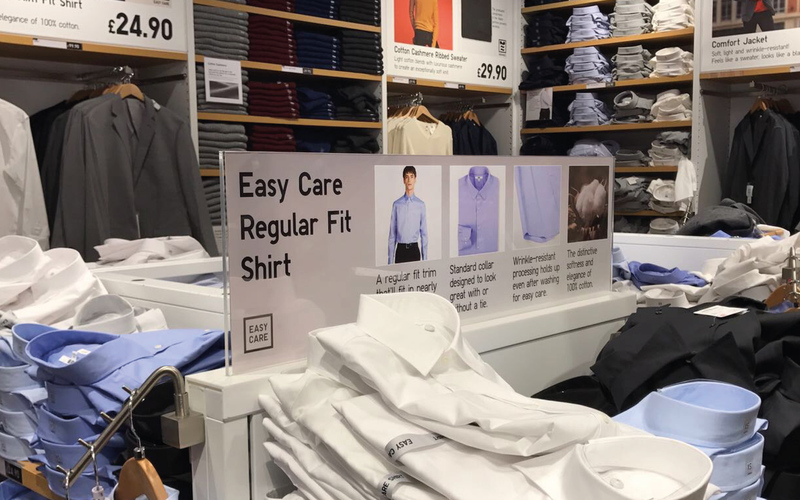 We were tasked with producing a new signage holder for three fixtures in menswear. A quick site visit, measurements checked and off we went. We designed and fabricated three acrylic fixture signs which sit snugly onto their existing shelving unit. Add some double sided prints (thank you oh fab sister company The Graphical Tree) and the signs were ready to go, all in under 48 hours. We dropped these off Friday afternoon and were really pleased that they looked so smart just in time for the weekend.